Four rounds of X-Wing, my first time playing against other people. I know, bit of a loner. 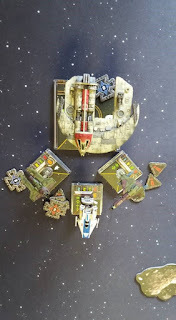 My opponent was running Poe Dameron, another T-70 and a Dagger Squadron B-Wing. Not entirely sure what all the upgrades were but for my first game this was a close one. After jousting a bit at the start I lost one of the A-Wings to Poe, then a round or two later another to the other T-70. I was busy flying Dash around the outside of the map firing inwards, eventually taking out the B-Wing. In what turned out to be the last round, Poe ended up on top of an asteroid and all I had to do was be in a position to hit him to take the lead. Unfortunately, inexperience showed and with Dash coming back towards me, I set the dial to a 3 left bank instead of a 3 right bank and proceeded to fly off the map and into oblivion. Krassis Trellix, Whisper, Mauler Mithel and another TIE. This was a very frustrating game. I lost an A-Wing early on to combined fire from Krassis and Whisper. I spent most of the game being hen-pecked by Whisper and only doing mediocre damage to Krassis in return. Thankfully towards the end of the game my opponent made a slight miscalculation and landed Whisper on an asteroid which I took full advantage of - Whisper died and I managed to do enough damage to Krassis with an A-Wing to get the half points. Again time ran out on the match, a very narrow victory, only 4 points. Still, my first win and very unexpected it was! Serissu, Talonbane and (I think) Dengar. It didn't end well. I was on the back step the entire game and as soon as Dash was in a close enough position my opponent tore through him like a hot knife through butter. I was unfortunate with the critical hits I was pulling from the damage deck as well - managed to pull two of the "deal no damage on your next attack" cards in a row. I was completely outplayed but as time was coming to an end my last remaining A-Wing just turned tail and ran to save me some face! My only consolation from this game was that my opponent was quite complimentary about my manouvering with my A-Wings and gave me very good advice relating to the build I'd selected. Even though I lost, this was probably my favourite game of the day. This was just one of those games. I was playing against a younger player who'd been eyeing up Dash the entire day and had made it his one goal to kill Dash. I could do nothing. He flew really well and kept some combination of TIEs inside range one of Dash the entire game. Eventually he killed him, he was overjoyed! I managed to kill two of the TIE's but it was too little too late. Again, I didn't mind the loss, learnt some valuable lessons on this one! So to sum it up, first tournament, 1 Win, 3 Losses. Came in 8th place out of the 9 attendees (was informed that there are usually more but this was ideal for me). Dash, whilst very agile, with the heavy laser cannon leaves himself far to vulnerable with the doughnut effect. Have since acquired a mangler cannon which I might use should I run him again. A-Wings, they are fast, exceptionally manouverable but they lack punch. I only flew them well in the third game but I really don't think I did them justice. There was no point in having the Green Squadron A-Wing in there - he died first in every single game. I was using him far too aggressively and think the points could have been better spent on a different ship. Now that I've had my baptism of fire, all I can do is take what I've learned and get ready for the next one! If you've made it this far, thanks for sticking with it, any comments are appreciated! Next up will be the Star Trek Attack Wing fleet selection for the organised play tournament.